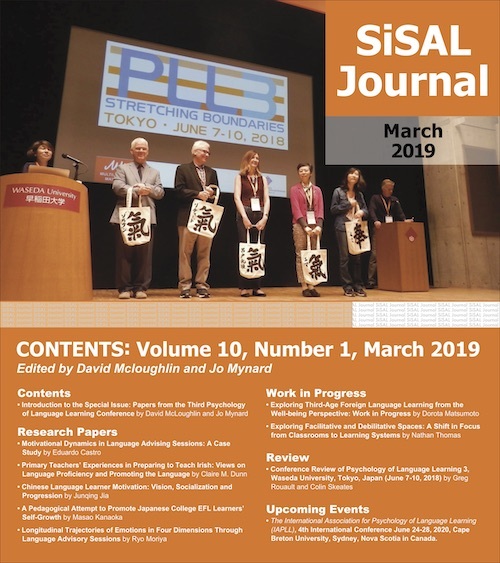 SiSAL Journal is planning to publish a special issue on self-access and young learners in December 2015 (Volume 6, Issue 4). The theme of this special issue is self-access and young learners, and the editors feel that bringing these two active areas of research and practice together is long overdue. Institutions investing in self-access language facilities and advising programmes tend to be at the tertiary level, yet there are benefits for providing such support in schools, public spaces, and community centres. Surely, if we are to equip our learners with skills for autonomous learning beyond the classroom, then the earlier we start, the better? However, we aren’t starting completely from scratch as there has already been some interest in the area. For example, in recent years the theme of ‘learning beyond the classroom’ has received an increasing amount of attention (e.g. Benson & Reinders, 2011; Council for Learning Outside the Classroom, 2015). We might also fruitfully draw upon related fields such as extensive reading (Day & Bamford, 1998; Robb & Kano, 2013 ); online learning and gaming (Sundqvist & Sylvén, 2014a; 2014b); Exploratory Practice (Allwright & Lenzuen, 1997; Dar & Grieve, 2013); and the power of stories for younger learners (Ahlquist & Lugossy, 2015). Although only a few writers (e.g. Gardner & Miller, 1999; Vettorel, 2015) have focussed specifically on self-access language learning aimed at young learners, we may refer to some previous work for direction, especially given that one of the aims of self-access learning is to promote learner autonomy and much of this work may actually start in the classroom. Examples include: developing autonomous learning skills in young learners (e.g. Ellis, 2011; Pinter, 2006); promoting critical thinking in young learners (Puchta & Williams, 2012); and young learner involvement in research (Pinter, 2014). Space design principles for supporting young language learners in self-access settings. Appropriate self-access materials for younger language learners. Supporting and/or promoting reading and/or writing outside the classroom/curriculum. Online and e-learning for young language learners. Supporting self-directed project work outside the classroom. Promoting learner autonomy and self-directed learning skills in young language learners for self-access. Support for speaking and/or listening skills development outside the classroom. Administrative and/or management systems and processes for running self-access centres for young learners. Staffing considerations and training for self-access for young learners. Submissions dealing with classroom-based approaches may be considered, but authors should make clear links with self-access learning for this special issue. Ahlquist, S., & Lugossy, R. (2015). Stories and storyline. Hong Kong: Candlin & Mynard ePublishing. Benson, P., & Reinders, H. (2011). Learning beyond the classroom. Basingstoke, UK: Palgrave Macmillan. Day, R. R., & Bamford, J. (1998). Extensive reading in the second language classroom. Cambridge, UK: Cambridge University Press. Ellis, G. (2011). Learner training and young learners. In C. J. Everhard and J. Mynard with R. Smith (Eds. ), Autonomy in language learning: Opening a can of worms (pp. 99-102). Canterbury, UK: IATEFL. Pinter, A. (2006). Teaching young learners. Oxford, UK: Oxford University Press. Puchta, H., & Williams, M. (2012). Teaching young learners to think: ELT activities for young learners aged 6–12. Cambridge, UK: Cambridge University Press. Sundqvist, P., & Sylvén, L. K. (2014b). Language-related computer use: Focus on young L2 English learners in Sweden. ReCALL.26(1), 3-20. doi: 10.1017/S0958344013000232.